Ottawa is Canada's capital. At the head of the city, rising dramatically on a bluff overlooking the Ottawa River are the stately Parliament Buildings, seat of the government of Canada. On December 31, 1857, Queen Victoria was asked to choose a common capital for the two provinces of Canada (modern Quebec and Ontario) and chose Ottawa. There are old folk tales about how she made the choice, but they have no historical basis simply illustrate how arbitrary the choice of Ottawa seemed to Canadians at the time. In fact, the Queen's advisers suggested she pick Ottawa for many important reasons: first, it was the only settlement of any significant size located right on the border of Ontario and Quebec making it a compromise between the two colonies and their French and English populations; second, the War of 1812 had shown how vulnerable major Canadian cities were to American attack, since they were all located very close to the border while Ottawa was (then) surrounded by a dense forest far from the border; third, Ottawa was at a point nearly exactly midway between Toronto and Quebec City and the small size of the town made it less likely that politically motivated mobs could go on a rampage and destroy government buildings. Today, Ottawa is one of the most beautiful G8 capitals in the world; rich in culture and heritage with its many national institutions, parklands, waterways and historic architecture. It is home to a large number of foreign embassies and is a recognized centre for both academics and professional training. The city offers an open and welcoming environment to cultures from around the world, providing service in English, French, and a host of other languages. The city’s residents enjoy an enviable quality of life that is recognized around the world. 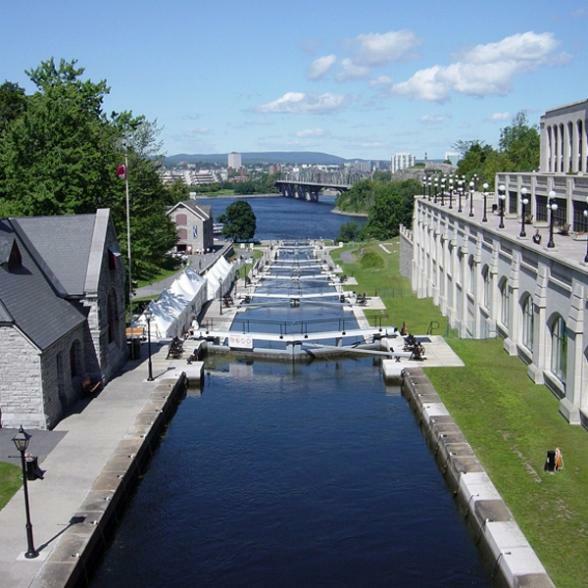 Central among the city's attractions is the Rideau Canal. The canal was opened in 1832 as protection against American aggression and is still in use today, with most of its original structures intact. It is the oldest continuously operated canal system in North America. By summer a lazy cruise down the canal is a delightful way to travel through the heart of the city and in winter the canal becomes the world's longest skating rink. 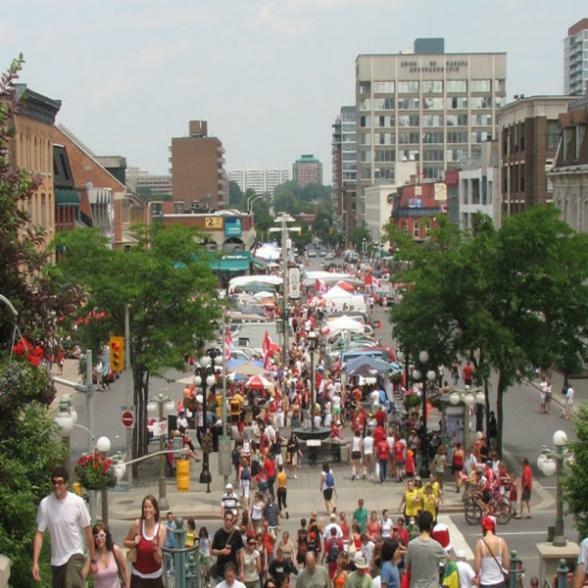 Visit Byward Market for wine bars and farmers' stalls loaded with flowers and fresh produce. Sample a "beavertail,” a deep-fried sweet pastry shaped like a beaver's tail. During the Canadian Tulip Festival in May, the city's gardens blaze with over three million tulips commemorating Canada's aid to Holland during World War II. And there's no better place to be than the country's capital for the July 1st celebrations of Canada Day. Bon Voyage have been providing tailor-made travel and holidays to Ottowa in Canada since 1979. Have your Ottowa holidays expertly tailor-made by Bon Voyage to suit your exact requirements, with the quality and service you expect, and at great value prices. The second largest country in the world, Canada is immensely rich in cultural treats that take their cue from the natural wonders of the land. Discover the highlights of East Coast USA and Canada on this fascinating tour including New York, Washington DC, Toronto, Ottawa, Montreal, Quebec City and Boston. The ultimate two nation vacation. Sample the east coast of America, historic Canadian cities and the thundering Niagara Falls. Witness the fall colours of New England, Montreal and Quebec on this 12 day holiday with acclaimed rail travel, grand hotel stays and all the brilliant autumn scenery you can soak up. The perfect introduction to East Canada's highlights, the scenic splendour of Niagara Falls meets the urban favourites of Toronto, Montreal, Quebec City and Ottawa. Discover why Canada is known as the Land of Maple Trees on this 11-day journey amidst the heart of the country’s heartland. Your adventure begins in Toronto with a day excursion to legendary Niagara Falls. Reflecting the confidence, dignity and style of Ottawa, Fairmont Château Laurier stands as a testament to this dynamic, thriving city.